Packing lunches for my little ones has always been a challenge. On top of figuring out what they will actually eat, I am not a big fan of the waste associated with plastic baggies. And, loading up a lunch bag with several small plastic containers can be inconvenient and perhaps even harmful considering the chemicals that can potentially leach from the plastic. So, when I came across LunchBots, 100% stainless steel lunch and snack containers, I was anxious to give it a try. 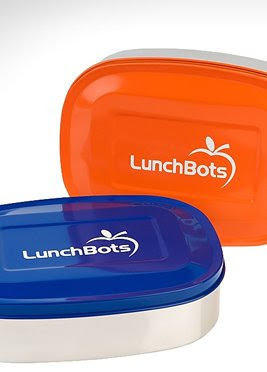 The creator of LunchBots came up with the idea because she felt the same way about the plastic containers and baggies that are so harmful to the environment and possible even us. My first impression upon receiving the LunchBots was that they were really cute! The LunchBot Uno has a single compartment and is designed to hold a sandwich or other main dish. The LunchBot Duo is divided into two compartments and is great for fruits and veggies or other side dishes and snacks. The lids are brightly colored, one orange and one blue, using powder coating on the outside of the lid only. Insides are the stainless steel. My only concern was whether my five-year-olds would be able to easily open and close them. So before washing and using them, I did my own kid test. No problem, they were able to open them themselves. (This saves the poor preschool teacher a little work.) The next day I proceeded to pack lunches and wait for their reviews. When they got home I asked them how they liked the Lunchbots...they both said they were good, but expressed the need to trade lids because one prefers blue over orange. Good enough for me. Lunchbots can be purchased separately or in a set of one Uno and one Duo. They do recommend hand washing and are best for solid foods. They are not water tight. Another thing that I noticed on the LunchBots website is that they have a school fundraiser program. This is great for a couple of reasons: Lunchbots are a lot healthier for all of us than the typical candy bar or cookie dough fundraisers and it promotes environmentally friendly practices for families and children. This is in addition of course to the money raised for your school. One last note, LunchBots has been kind enough to offer all of our readers free shipping should you choose to order. Just enter coupon code FREESHIP09 at checkout. You can also follow LunchBots on Twitter @LunchBot, that's how we met!